Concrete that has been specified, batched, mixed, placed, and finished “letter-perfect” can still be a failure if improperly or inadequately cured. Curing is usually the last step in a concrete project and, unfortunately, is often neglected even by professionals. Curing has a major influence on the properties of hardened concrete such as durability, strength, water-tightness, wear resistance, volume stability, and resistance to freezing and thawing. 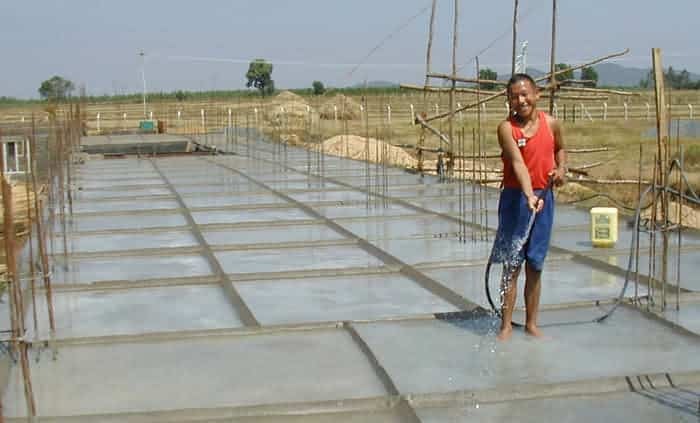 Proper concrete curing for agricultural and residential applications involves keeping newly placed concrete moist and avoiding temperature extremes (above 90°F or below 50°F) for at least three days. A seven-day (or longer) curing time is recommended. Keep water on the concrete during the curing period. Such methods provide some cooling through evaporation, which is beneficial in hot weather. Prevent the loss of the mixing water from concrete by sealing the surface. Size and shape of the concrete surface. Begin the curing as soon as the concrete has hardened sufficiently to avoid erosion or other damage to the freshly finished surface. This is usually within one to two hours after placement and finishing.